Georgia’s Prime Minister Irakli Garibashvili has released a special statement, in which he expressed his “shocked” at the terrorist attacks in Turkey’s capital of Ankara on October 10, which claimed the lives of 90 people and injured at least 245 others. 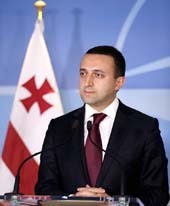 Garibashvili offered his condolences to the victims’ families and the Turkish nation. He implored them to stand strong at this difficult time. “Terrorism is the biggest threat facing the civilised world; it is so dangerous as it has no boundaries. No country is cable of coping with this international threat alone,” said Garibashvili. According to Turkish officials, two explosions took place at a peace rally in Ankara shortly after 10am. The blasts took place near the city’s central train station as people gathered for a peace march organised by left-wing groups. The rally was due to start at midday. Television footage of the protest caught the explosion and the immediate aftermath, showing scenes of panic and people lying on the ground covered in blood. The attack is understood to be the deadliest of its kind in Turkey. The BBC reported that Turkey’s Prime Minister Ahmet Davutoglu said there was evidence that two suicide bombers had carried out the attacks. He also announced three days of national mourning. The Ankara rally was demanding an end to the violence between the Kurdish separatists factions and the Turkish government.